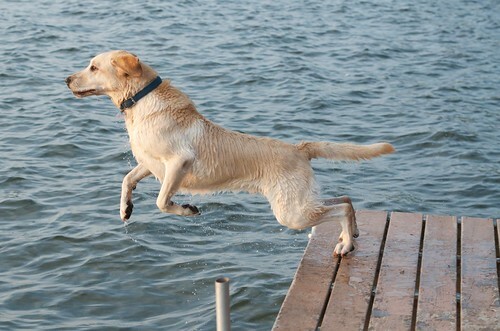 Beacon Shores – Aug 2012 – Budy the Labrador Goes Dock Diving, originally uploaded by pmarkham. The last couple of years I’ve had the opportunity to photograph the dogs of the owners of Beacon Shores Resort during the “Golden Hour” right before sunset. Buddy, the younger of the two labs, loves to chase balls and sticks and will jump off the dock at full speed in an effort to retrieve a ball. This was shot with my F2.8 70-800 Nikon lens and my D7000 camera body. I shot the whole sequence of him jumping off the dock and landing in the water.